Last month, the European Space Agency announced that an unknown object was streaking through space with Earth squarely in its path. 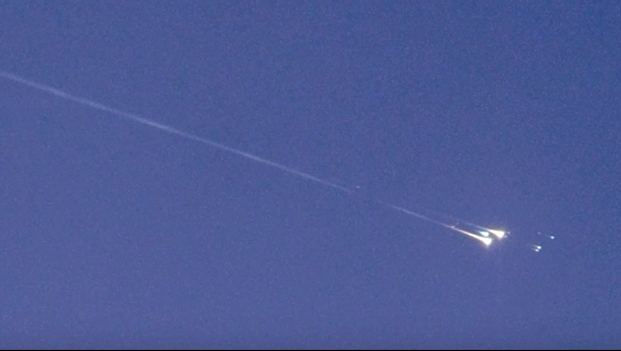 The projectile -- know by its catalogue number, WT1190F, but popularly referred to in the media as "WTF" -- was spotted early Friday beginning its fiery descent toward the Indian Ocean. An international team of astronomers and the United Arab Emirates Space Agency observed the 1-meter wide piece of space debris flaming across the boundary of space, about 60 miles overhead south of Sri Lanka. WT1190F was first discovered in 2013 by the Catalina Sky Survey, which identifies near-Earth objects in space. It had been observed several times since then by the same team. In October, the object was sighted again and it was determined that it was likely to enter the Earth's atmosphere Nov. 13. Any pieces that managed to survive burn-up upon reentry were expected to land in the Indian Ocean. Scientists were unable to identify WT1109F as it approached, but were fairly certain it was not an asteroid, but manmade -- likely a discarded rocket body, possibly a remnant from a recent Chinese mission, or even dating back to the Apollo era. Experts were excited not just to identify the mysterious space junk, but also to use the unique opportunity to track it for so long to learn more about how objects, including retired satellites as well as debris, behave upon reentry into Earth's atmosphere. "Second, it provides an ideal opportunity to test our readiness for any possible future atmospheric entry events involving an asteroid, since the components of this scenario, from discovery to impact, are all very similar," Marco Micheli, an astronomer at ESA's Near-Earth Object Coordination Centre, said in October.